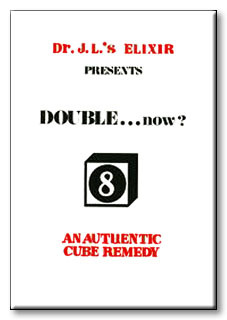 COVER: Dr. JL's Elixir proudly presents an authentic remedy for your Doubling Cube ills. The formula for when to double and when to take is presented for the very first time. Also presented for the first time is the formula that expresses the value of cube ownership. These two newly discovered formulas are elegantly merged to solve one of mankind's oldest ailments: backgammon. The hundreds of examples presented herein are in a standardized form. By learning the position and its proper cube action the game can now be mastered. AUTHOR: Born near Mare Island, CA, during WW II, James Lortz was raised in Idaho Falls, Idaho. After a stint with the air force that included one year of electronics training he attended five colledges in eleven years and emerged with a Ph.D. in electrical engineering with an emphasis on computers and spent the following twelve years with an Idaho steel fabrication firm, first as a design engineer and then, for six years, as company president. After spending the next six years a a consulting design engineer in California he returned to Idaho, where he currently resides. Dr. Lortz is the father of three teenage children.